234 to 242 Greene St. B. E. D.
Henry C. Fischer's iron works were established initially around 1870 at 440 Graham Ave. at the corner of Richardson St. in Brooklyn, N. Y. They moved briefly to Clay St. around 1880, then settled at 234-242 Greene St. around 1883. This address is in the Greenpoint section of Brooklyn. They stayed in business here until approx. 1910-12. Henry C. Fischer (1858-1924) was born in New York, April, 1858. In the 1870 U. S. Census he was 12 years old and lived with his father, also Henry Fischer, an iron moulder and an immigrant from Prussia. The family had six children, including Julia, 14, Henry, 12, Carrie, 10, and Peter, 8. In the 1880 U. S. Census he was 22 years old and the head of household at 449 Graham Ave., Brooklyn. Living with him were his brother, Peter Fischer, age 18, and two of his sisters, Julia and Carrie, ages 24 and 19. The 1880 U. S. Census (non-population schedules) recorded Henry Fischer, Foundry as owning $10,000 in real capital and $14,188 in raw materials. It employed an average of 10 men at annual total wages of $4033. Manufactured products in the preceding year were valued at $26,242. These are modest figures compared to the larger foundries of the time, but show a reasonable profit. "Henry C. Fischer, 119 Norman Ave., Bk'lyn," is listed among the delegates and alternates to the National Republican Convention, Philadelphia, Pennsylvania, June, 1900. Fischer's brief death notice in the New York Times, 25 Dec 1924, p. 17, read, "Henry C. Fischer, formerly in the iron foundry business and at one time active in Republican politics, died on Tuesday at his home, 670 St. Mark's Avenue, Brooklyn, aged 66 years." This advertisement for H. C. Fischer's Iron Foundry appeared in Lain's Brooklyn Directory, 1884. This one appeared on the back cover of the 1891 Brooklyn directory. Both say "Established 1862." This seems a bit early. Fischer would have been four years old in 1862. Possibly, this established date refers to his father, who would have been in the iron business by this date, if not earlier. This advertisement for Fischer appeared in Trow's Business Directory of the Boroughs of Brooklyn and Queens, 1899. It is aimed at his business creating "fixtures" used in the bakery industry. In this ad Fischer mentioned a location on Huron St., although this may have been merely an extension of the foundry on Greene St., the two addresses being back-to-back in the same block. A similar advertisement appeared in the Brooklyn Daily Eagle Almanac, 1900. 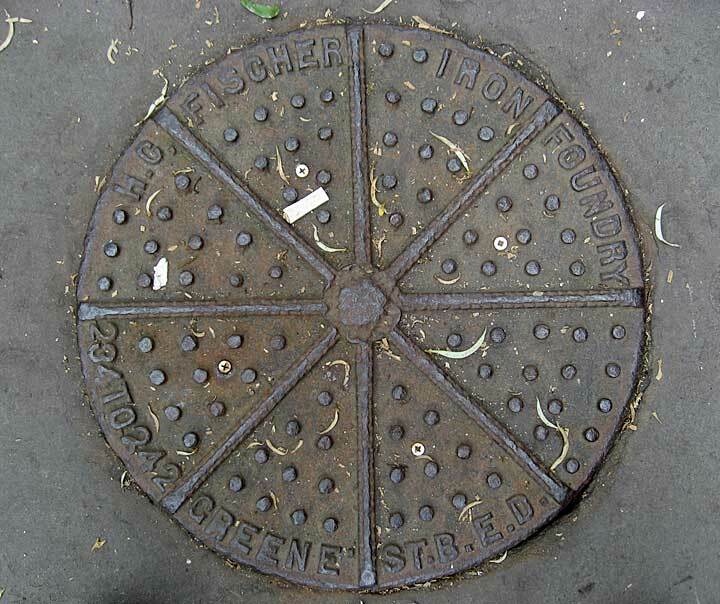 The "B E D" at the end of the Fischer Foundry's Greene St. address stands for Brooklyn Eastern District. As explained by Eugene L. Armbruster in The Eastern District of Brooklyn, 1912, "The Eastern District was created when the consolidation of Brooklyn, Williamsburgh and Bushwick took place, in 1855. It included Williamsburg, Bushwick and North Brooklyn. The Western District included the remainder of the enlarged city."